Wonderful work and a charming scene, very well executed! 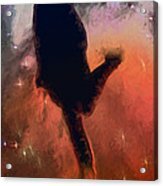 Inspired by the TV show where Hollywood Stars are the partners, this piece has galaxies and nebulae, and space stars for this female dancer. 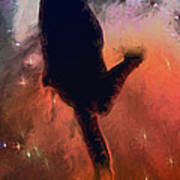 Silhouetted against the night sky, leaping from a fiery base, the figure almost jumps out of the picture. You can feel the movement and hear the beat.